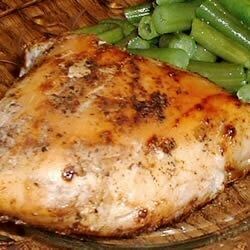 "Mouth watering lil' chicken recipe I thought of one day at work...."
To Marinate: Place chicken in a nonporous glass dish or bowl. Pour wine all over and toss to coat. Cover dish or bowl and refrigerate to marinate for at least 2 to 3 hours. Remove chicken breasts from wine (discard any remaining wine) and season with basil, paprika, garlic salt, salt and pepper. Heat oil in a medium skillet over medium high heat. Add chicken and saute on each side until a nice brown/red color is reached and the inside is no longer pink (20 to 30 minutes). A little too acidic for my taste. need to use a wine that you would like to drink. Great flavour, with such simplicity! I only added it so I could rate it - it's so easy to remember. I used a Red Zinfandel wine for the marinade. It tasted wonderful and my husband loved it too! I will probably try this recipe again though I thought it was a bit bland. I used a French Cabernet. simple yet delicious - definitely a keeper!